Soft pinks and elegant purple blend together. The flowers are blooming and the spring concert tours have begun. We've seen the early signs of music festivals as well with Coachella ending it's second weekend (finally). I'm glad to leave Coachella behind and the underwhelming outfits of this year, except for maybe any Nicole Richie branded ones. Though, I've already kinda had my own share of music experiences in April so far including Jukebox The Ghost, Hurray for the Riff Raff, The Decemberists, Beach Slang, and Dashboard Confessional. I'm up for more shows next month, so hope you tune in when I tune in here. The sun is out and the days are longer, so I've been inspired to incorporate some outer elements into my style. I've got some bright colors lined up for this year. It's a rare treat since I've decolored and depatterned most of my wardrobe last year. 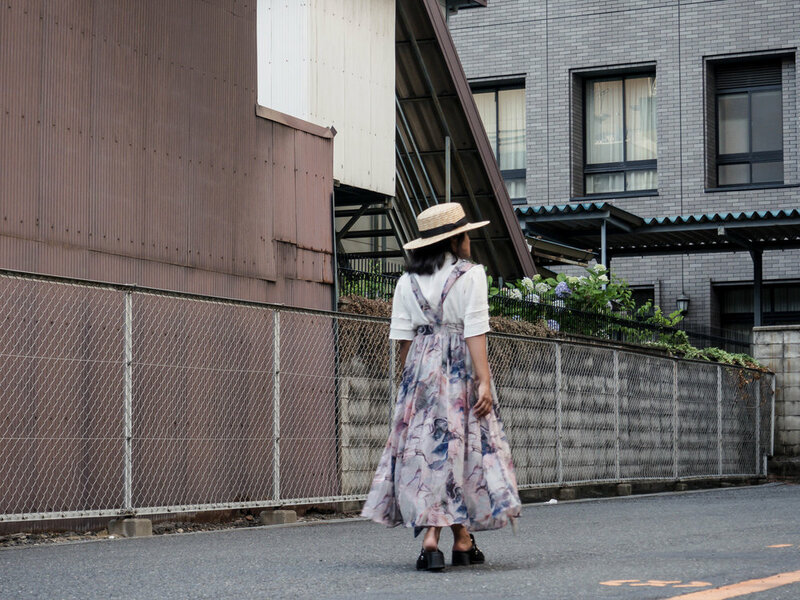 I fell in love with this Lost Ink watercolor floral midi skirt last year which features cute suspender-like straps. It has the beginnings of a maxi skirt for me, but nothing some heeled shoes can't make better. 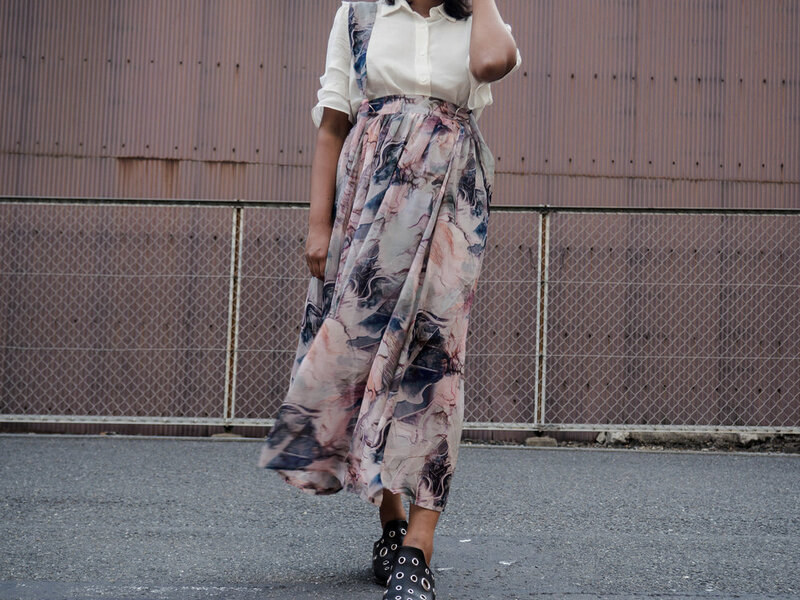 If you're looking a petite solution to a maxi skirt, midi skirts are a great alternative to covering the length and not worrying about extra fabric dragging in the dirt. I paired the skirt with my favorite Reformation classic white chiffon button-up top with frilled sleeves. Not to stray far my sassy personality, the collar features "I regret nothing" sewn in as a reminder. This is a great and easy look to wear on vacation when you want to feel little romanced and elegant. It's very whimsical and has a light feeling to it. I can see myself walking through a flower field or having a park picnic in this look. I also feel more approachable and friendly. No one needs to know about my self-deprecating humor just yet.